Moving houses can be stressful time for you and your family, including your dog. However, many of us forget to prepare our dogs for the big move. Fortunately, most dogs tend to adjust quickly to their new home, i.e. as long as we are there with them. Some dogs however find changes like moving houses difficult to deal with. If your dog is generally nervous or likes his routine, then you should prepare for big changes like this in advance. Our dogs are very aware of our mental state and will quickly pick up our stress of moving. When the boxes come out, they are likely to become anxious and agitated. Following these tips can help to take some of the stress out of the moving for your dog. Dogs love routine so sticking to your normal routine the days before and after the move will really help your dog to relax. And don’t forget to the actual moving day, your dog still needs his walk, feeding and playtime. So try to stick to your regular feeding times and make sure your dog gets adequate exercise. Exercise is very important as it helps your dog to relief stress and acts as sedative (increases the natural serotonin level in the body). Dogs experience the world very much through their noise, so allow your dog to smell around the new house. Make sure you bring something that smells like the old house for your dog to sleep on when you first arrive at your new home, e.g. blanket or towel. Don't pack your dog’s stuff away until you are ready to move your dog to your new home. For example, if your dog uses crate, let him have access to it while you are packing. If your dog is around when you are packing or unpacking, try to keep him occupied with something fun, like chewy treat or new toy. Don't forget to take a break regularly to interact and play with your dog. This will help to alleviate some of the stress caused by the disruption of normal routine. On the actual moving day, it is important to keep your dog safe and out of the way of the movers. There are many potential dog hazards around on the day, like the moving van and there may be strangers around (professional movers). It can be easy to forget to close a gate, allowing the dog to escape. All kind of things will be lying around, which can be hazardous for dogs if swallowed. So keep your dog safely out of the way. You may even spare him the hassle and ask someone to look after him elsewhere while most of the action is going on. If your dog is very anxious, then you may ask someone to look after him while you are packing and moving. The dog will then move into his new home when things have settled down. As long as he will find his old stuff (and familiar smell) and have his family around him, he should settle in quickly. If you are moving long distances, then you must prepare your dog in advance. If you are driving to your new home, make sure your dog is comfortable with long car journeys. If you are flying, then you need to make the necessary arrangement well in advance. Help your dog to settle in the new home. Make sure he has familiar things and smell around him, allow him to explore and make sure your new home and garden is dog proof. If your dog is a flight risk, keep him on a leash when outside of the house. Dogs that have not adjusted to a new location may try to find their way back to their old home. 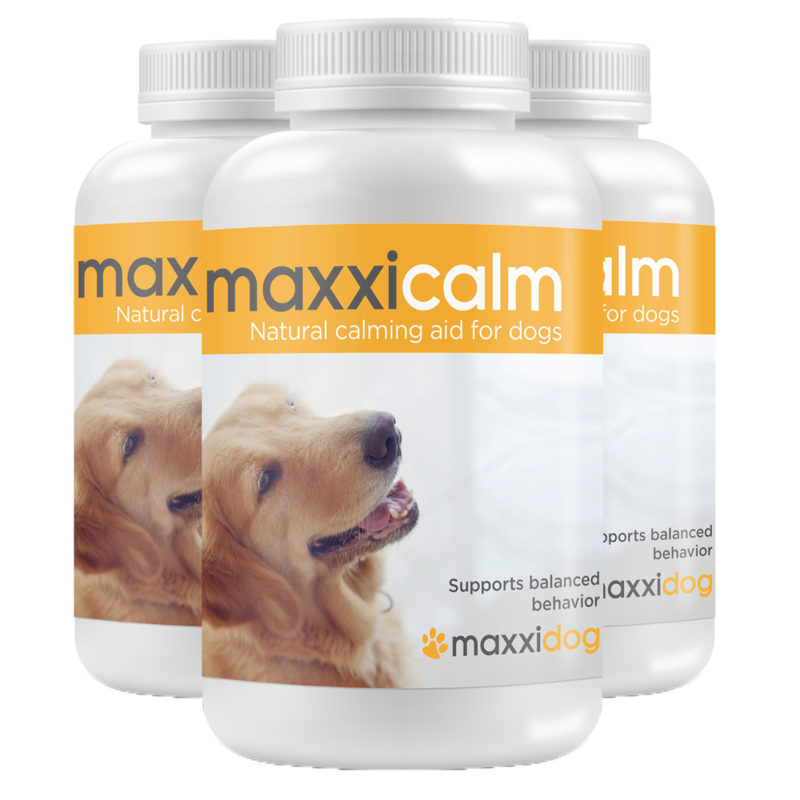 Natural calming aid for dogs, like maxxicalm, can help your dog through this stressful period. For best results, you should start using it few weeks prior to moving (starting packing). You should still follow the other tips, like sticking to normal routine as much as possible. As always, you play an important role in your dog's life. Your attitude will affect your dog. If you are stressed or nervous about moving, your dog will notice it. So try to stay calm and collective during the progress. Most dogs will be fine when you have settled in your new home. However, if your dog has serious problems with adjusting to new situations, then you should seek professional help (canine behaviourist).